1. Plastic Bags – Plastic bags are everywhere, and are not usually accepted by standard recycling services. However, stores such as Ukrops, Walmart, Food Lion, Kroger, and Whole Foods all accept plastic bags for recycling. A special blue recycling bin will be placed in the central kitchen for plastic bag recycling. What plastic bags are included, you ask? Please only place these items in the plastic bag recycling bin, and not in the standard recycling bins. A Seeds of Green member will take the bags to an appropriate recycling center on an as-needed basis. 2. #5 Plastic – #5 plastic containers, caps, and lids are not recyclable through most standard recycling services. This category includes the caps from water and other drink bottles, plastic straws and coffee stirrers, as well as containers such as margarine, cottage cheese, sour cream, and yogurt tubs. Other likely candidates are ketchup and shampoo bottle tops. Look for the #5 label on these items. Blue recycling bins will be placed in each kitchen for their collection. A Seeds of Green member will take these items to Whole Foods for recycling on an as-needed basis. Whole Foods participates in Preserve’s “Gimme 5” program. The #5 plastic is used to make toothbrushes, razor handles, and a variety of kitchen products. 3. Tyvek Envelopes – DuPont™ Tyvek® envelopes are made of high density polyethylene which is 100% recyclable. DuPont manages a nationwide recycling program that collects used Tyvek envelopes – even those that have been printed on – and recycles them into other useful materials that provide sound alternatives to the use of wood, such as park benches, playground equipment, etc. A DuPont used Tyvek envelope collection pouch is located in our office supply area (on the bottom shelf below the pens and pencils). Seeds of Green members will ship the envelopes back to Dupont when enough have been collected. 4. Compact fluorescent lamps (CFLs) – CFLs have received plenty of positive attention over the last several years since they use a fraction of the energy of traditional incandescent bulbs, and have a lifespan of about 10 times longer. However, burnt out or broken CFLs do need to be properly disposed of since they contain a small amount of mercury. Moseley has a fluorescent lamp collection and recycling program for office lamps, and used CFLs or other fluorescent lamps from home can be included. Burnt out or broken CFLs that you bring from home can be given to Dusty Sims in a sealed plastic bag, and he will add them to our office fluorescent lamp recycling bin. Note – It is important to handle broken CFLs carefully to avoid exposure to mercury. The EPA recommends carefully sweeping the broken bulb pieces into a sealed plastic bag, and picking up any small residual pieces with sticky tape or a damp paper towel. Vacuuming is not recommended. See the link below for further information on mercury in CFLs. Don’t forget about our existing battery recycling container that is kept in the administration suite. Keep an eye out for more exciting special recycling efforts in the future! Do you have old cell phones, chargers, or phone batteries lying around your house? Moseley Architects’ Seeds of Green members would like to put those phones toward a good cause. Bring in your old phone equipment, whether it works or not, and we will collect them and arrange for their shipment to ReCellular using their prepaid labels. If you don’t feel like removing your personal data from your old phone, don’t worry, they will do it for you. Collection boxes will be located in each office. Here in Richmond the collection box is located in the Green Pod on the desk between Gillian and Bryna. Check with your Seeds of Green liaison for the box location in your office. Read more about the program at www.phonesforhaiti.com, and in the brief article below. ANN ARBOR, Mich., January 14, 2010– ReCellular today announced a new way for Americans to provide support to the millions of victims of the January 12th earthquake in Haiti. Used cell phones can be sent in by downloading a prepaid mailing label at www.phonesforhaiti.com, with the proceeds going to the American Red Cross’ charitable efforts. There are an estimated 130 million phones retired in the United States every year. If even a small percentage of them are sent to Phones for Haiti, it would contribute millions of dollars towards relief from the devastating earthquake. ReCellular will give 100% of the phone value as a contribution to the American Red Cross; charities have already earned more than $20 million dollars in contributions through their partnerships with ReCellular. With rescue and repair missions already underway, it is critical that funds get to the region quickly. By using the postage paid label, supporters can have their used phones to ReCellular within just a few days, allowing for the rapid distribution of funds. All phones are accepted, though newer phones will provide the most value to the charity – in some cases $100 or more. The call for your unwanted dishes, cups, and flatware was answered! 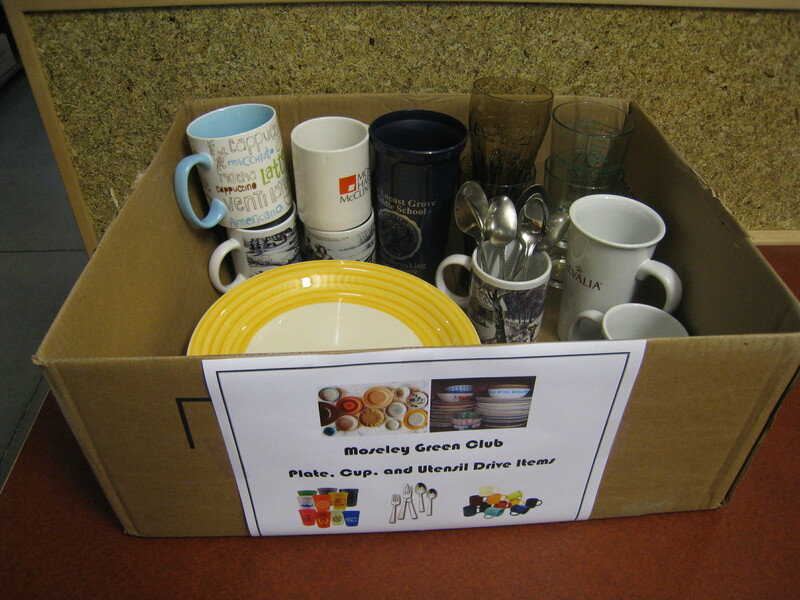 In our Richmond office dish drive, we collected numerous glasses, cups, mugs, plates, bowls, and spoons, which are available for your use in the three office kitchens. We could still use bowls, plates, forks, and knives, so check your cupboards at home and see if you have some of these items that you wouldn’t mind donating. Hopefully the availability of these items will encourage folks to use them instead of their disposable counterparts. Remember to check the cupboards for a reusable item before you grab that paper cup or plate. When you’re finished, just set it in the dishwasher. A Seeds of Green member will make sure the washers are run when full, and emptied when clean.